“Super Indian” made it’s first successful appearance as part of a panel at a major Comic Con! Hooray! Arigon was calling it “Baby’s First Comic Con,” and it certainly was one to remember. 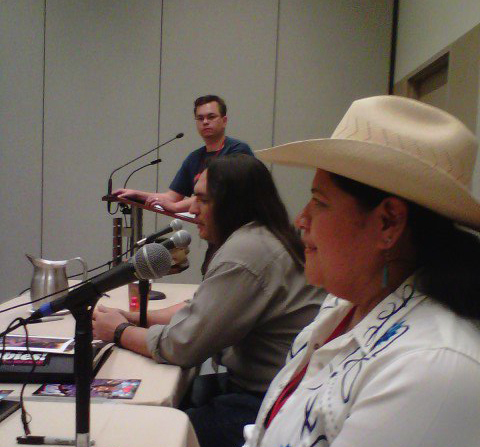 Artist Jacques LaGrange pitched and put together the panel “Natives in the Comic Book World” and the panel drew a good crowd during a busy Saturday afternoon at the Phoenix Convention Center. The audience asked very thoughtful questions and seemed to really want more Native-themed stories, art and creators. “It was great to not have to explain everything about being Native and why we want to tell the stories we want to. The crowd was really knowledgeable and made all of us feel welcome,” smiled Arigon. 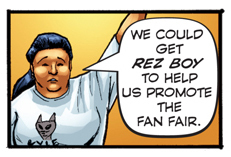 We have a quick look at an upcoming character in the Super Indian Universe — Hubert’s cousin Myra Hill. Note that Myra is sporting a “Kyle” t-shirt. “Even I don’t have a Kyle t-shirt. That makes me very cross,” snorted Arigon. Kyle t-shirts are definitely on the list! More from Comic Con and lots of fun photos to come! Now, Arigon will join her fellow artists Jacques LaGrange and Teddy Tso over at the San Diego Comic Con. “No panel for us this year, but hopefully in 2012, we will all have books out,” said Arigon. She will also visit and talk with other artists to get their perspectives on self-publishing and promoting their comics. “This is every bit as tough as the music business. The same dynamics are in play — who you know, relationships to be fostered and being visible and participating.” Viva Super Indian! Previous I Get Around…and Have You Seen Kyle?